Mark Rudkin of Inverness who has a 1969 classic Beetle. Struggling to make sense of words on a page, five-year-old Mark had all but given up trying to read. His frustration was quickly forgotten when an imaginative teacher set him on the path to what would soon become his biggest passion. Instead of forcing him to read basic children’s books, Mark, who was already showing a keen interest in cars, had a magazine dedicated to Volkswagen placed in front of him – and has never looked back. 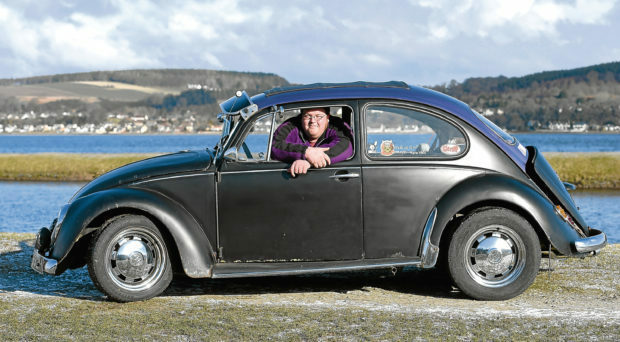 Now able to read and drive, Mark was 17 when he bought his first Beetle, a beaten up old motor which had previously been used as a static promo car for a bar in Inverness. It needed a huge overhaul to get it roadworthy, and although a series of unfortunate events means that even today it has never seen the open road, Mark can’t bear to part with it. But now aged 32, Mark has a new favourite: Dribbles. A retro 1969 Volkswagen Beetle 1500, Dribbles is matt black with a metallic purple roof and has been under Mark’s tender care for little over a year. “It’s not a perfect car by any means,” said Mark, who works as a roadside technician. “It’s a bit rough and ready but that’s what gives it its character. “In some places you can see where the weather has worn away at the matt black and there are tiny flashes of the orange and yellow paint underneath. “And we call it Dribbles because it leaves a little dribble of oil everywhere we park it. And although Dribbles might be showing its age, it’s by no means less reliable than any other classic car. “We used the car on our wedding day,” said Mark, who lives in Inverness. “My wife arrived to the church in it. “Then we drove it on our two-week honeymoon up to Orkney last summer. But Dribbles wasn’t the only choice of honeymoon transport available to the newlyweds, as Mark has a considerable Volkswagen collection which includes a 1969 Beach Buggy, 1975 classic Beetle, 1968 Herbie-style rally car and the bare bones of a 1959 Beetle – his current project. “My wife is very understanding of my car collection,” said Mark. “I have contemplated selling some of them in the past, but it was my wife who convinced me otherwise. “She said ‘you don’t drink, you don’t smoke – this is your hobby’. “And she’s right, they’re my vice. Another quality which draws Mark to the Beetle is their character, both imperfect yet loveable in equal measure. “Take Dribbles for example, it’s rare to see one in the matt black colouring. “And in addition to that, there are the sloping front headlights, chrome bumper and big sunroof which certainly aren’t typical of the standard Beetle design. “There is even thick velour-type padding on the inside of the doors which I like, but might be a bit of an acquired taste. “No two cars are the same, and they drive differently too. “The brake pedal is hard to push and takes a bit of getting used to especially if you’re coming from a modern car. And Mark has plans to do a lot more driving this summer, hoping to show Dribbles off to like-minded Beetle enthusiasts around the UK. “We aren’t going on a big holiday this year so I’m planning to do lots of car shows instead,” Mark said. “I’m a member of a few clubs, like the Highland Dubbers which is for Volkswagen enthusiasts around Scotland. “We do lots of camping weekends and meet-ups so I’m hoping to go to more of those. “My friends laugh at me sometimes because I’m 6ft 2in and I’m cramming myself into a tiny Beetle. “But I don’t care to be honest, I’ve already got my dream car.